Japanese two-dimensional works of art can take a number of different formats—printed books (ehon), single- or multi-sheet prints (hanga), paintings in the form of hanging-scrolls (kakemono) and handscrolls (emaki), moveable folding screens (byōbu), usually in pairs, sliding door paintings (fusuma-e) and smaller scale fan paintings and album leaves. The screens and sliding doors also served to exclude draughts or divide rooms, and were changed according to the season. Hanging-scrolls were displayed, sometimes in pairs or sets of three in the tokonoma (ceremonial alcoves) of reception rooms of mansions and, again, could be changed according to the season, or to honor a special visitor. All such works were viewed seated at floor level on tatami mats. 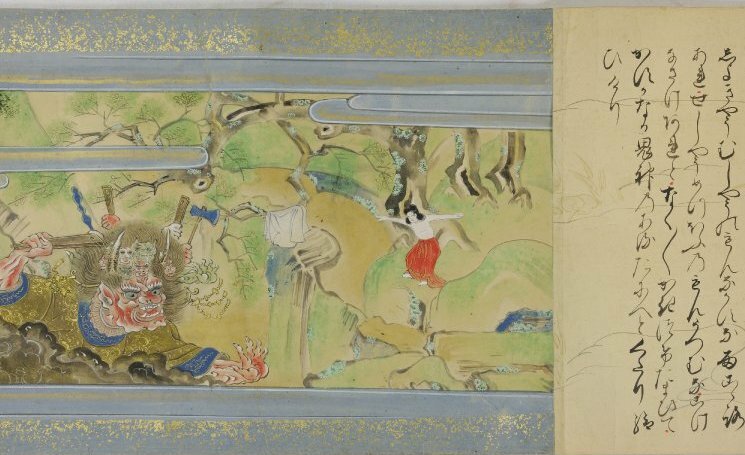 Shaka no honji (The Story of Sakyamuni), from a set of three hand scrolls, ink and color on paper, 17th-18th century, 32.9 x 1703.4 cm, Tosa School, Edo Period, Japan © The Trustees of the British Museum. The story, which evolved in medieval Japan, interweaves the basic religious message of the life of Prince Siddhartha Gautama through his enlightenment to become the Buddha Shakyamuni (Japanese: Shaka), with the more human story of his relationship to his mother Queen Maya. In this scene he gains enlightenment. Handscrolls (like the one above) were usually placed on a low table and unrolled from right to left to show a narrative story or seasonal sequence. Print series, small-scale paintings or fan paintings were often mounted in albums. Individual prints, especially the Ukiyo-e portraits of popular actors or courtesans, might be pasted to a screen. The size of the print was limited by the size of cherry-wood block available. Often two, three or more sheets were arranged side by side to depict a wider scene. Books were printed two pages to one sheet of paper, which was then folded, and the sheets sewn together at the spine with a plain cover. Kakemono (hanging scrolls) were originally used to display Buddhist paintings, and calligraphy. The painting in ink and colors on either silk or paper was backed with paper and given silk borders chosen to harmonize with the painting. Finally, a roller was affixed to the bottom. Scrolls were kept in specially made paulownia wooden boxes to protect them from dust, changing climate conditions and insect damage. 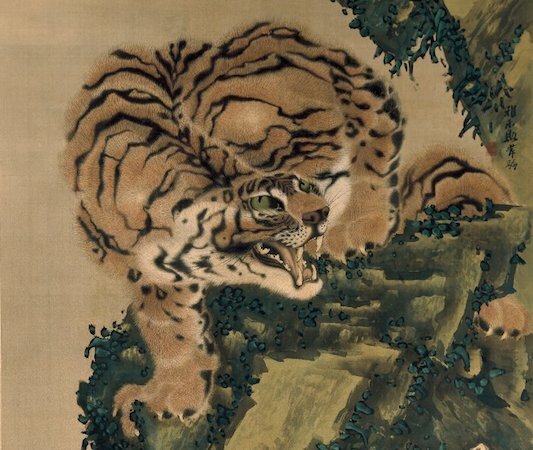 Tiger paintings were very popular in Japan, but as the artists would never have seen a real tiger, they must have worked from skins. Gan Ku became famous for his paintings of tigers and has brought this one immediately to life with his strong imagination and skilful brushwork. The fearsome advance of the beast towards the viewer is suggested by the powerfully hunched shoulders, the placing of its feet and the tip of the tail, just visible, which all emphasize the animal’s size and strength. Gan Ku has used the careful brushwork of Chinese academic painters to depict the tiger, while the setting of tree, rocks and water is in a much freer, dynamic style typical of his later ink and wash works. In 1784 Gan Ku entered the service of Prince Arisugawa and for this painting he uses the art-name Utanosuke which was given to him by the prince. He seems to have used this name until about 1796. Cite this page as: The British Museum, "Japanese art: the formats of two-dimensional works," in Smarthistory, March 1, 2017, accessed April 19, 2019, https://smarthistory.org/japanese-art-the-formats-of-two-dimensional-works/.